Our next update to Food Fight will be a milestone. 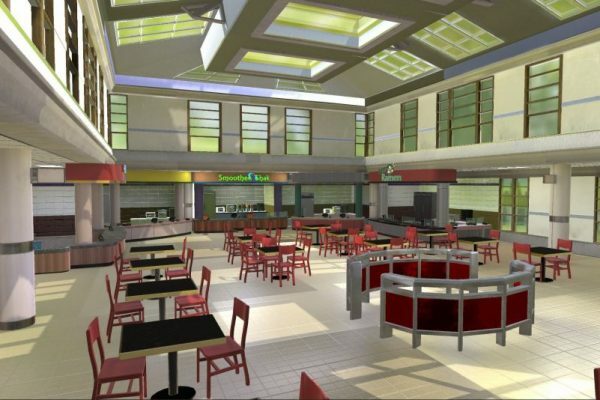 We are adding a brand new, custom-modeled food court environment. Additionally, food items have been revamped with new behaviors that will make playing Food Fight even more fun. However, with a recent change in trends for virtual reality, this might be our last major update to the game we know and love. Recently, Oculus released their new product, the Oculus Go. The Oculus Go is a head-mounted display similar to the Oculus Rift or Gear VR, but it does not require an expensive PC or mobile phone to run. Instead, it has the hardware built into the HMD. The price is also drastically less expensive than the Rift or HTC Vive. Many small/indie studios are turning to the Go to develop their applications since it is more affordable and much easier to set up than other VR displays. 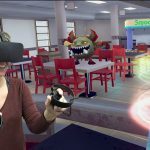 Food Fight was developed on the Rift specifically and was eventually planned to be ported to the Vive and PSVR displays. With the rising popularity of Oculus Go, we may shift our focus to a different product for this new headset or port Food Fight over to the Go and continue development. With that being said, this will be a multi-part blog. 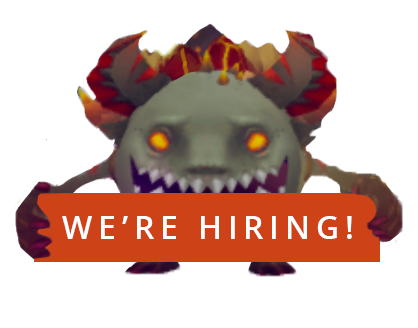 This first blog will cover our recent additions to this potentially last update and we will end with a retrospect over the entirety of Food Fight. 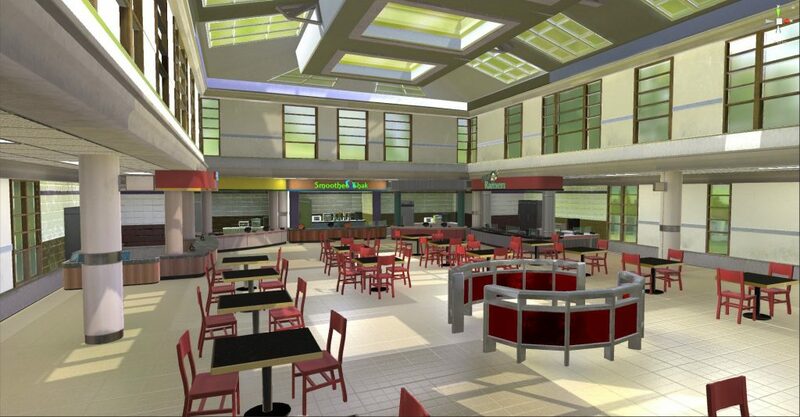 Recently, a new environment was modeled for Food Fight, the food court. It was created after a decision to move away from the cartoonish, simple kitchen that was constructed from third-party assets. 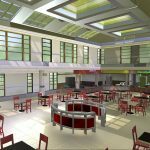 The food court serves as a good example of a location where people are faced with good/bad eating decisions. 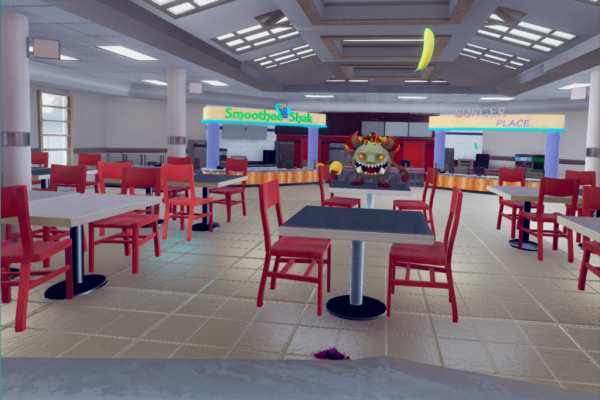 We like the food court so much that we wanted to remove all of the old cartoonish levels and keep the entire game to one room. This means no more main menu. Instead, users can change all game settings from the menu on their wrist. After loading in the game for the first time, there will be no more additional loading screens. Having a single level means that the tutorial will need to be included somehow. In past blogs, we discussed how Food Fight’stutorial should have minimal text and convey interactions through symbols and gameplay components. 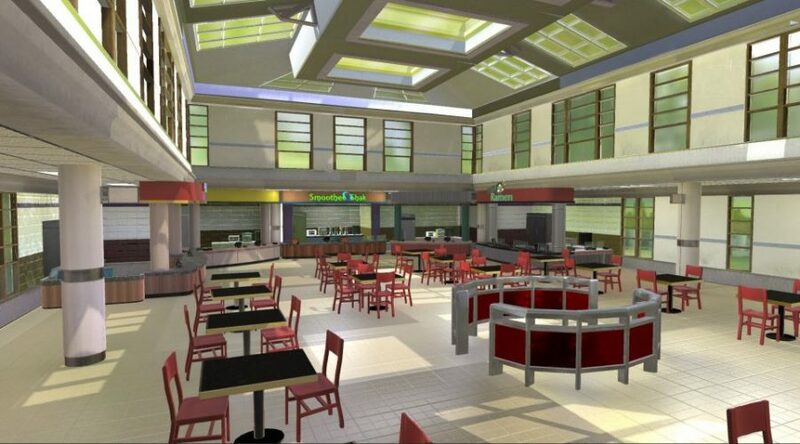 This concept still remains for the food court. The same steps will be brought over and expanded to cover all possible interactions, such as wiping food splatter off the visor. The tutorial will automatically begin for first-time players and can be replayed by selecting an option in the menu. Lastly, we added a food tray to the level that players can use to block food items. During playtests and demos we saw players using power-ups and food to create makeshift barriers to block incoming food. By adding a shield in the form of a food tray, players have the option to use it at any time when fighting the food goblin. When it came to the physics of throwing food, there was a difference between it being thrown by the player or the food goblin. When thrown by the food goblin, the food did not respond to gravity. It would float in a straight line to the player. However, when the player threw food, gravity acted upon it and it would arc depending on how hard the player threw it. We applied gravity to the goblin’s throw to make it look more natural and to mimic the player’s throw. We also added an option to change the food court’s gravity between standard earth gravity, moon gravity, or no gravity. The higher the gravity setting, the more difficult it is to throw and dodge food. A food scatter behavior was added to all food items. Instead of going in a straight line to the player’s visor, randomness is added so that food will be thrown at different angles towards the player. This was done to increase the rate at which players dodge rather than catch and throw foods. The player will not be able to stand in one spot anymore and will need to move around to avoid or catch foods, more so on higher difficulties. This will also force the player to utilize power-ups and the tray to block or move foods away from their visor. With diet-based gameplay on the backburner, we decided to return to a single food list that governs what food is spawned and thrown by the food goblin. Keeping to the idea of good vs. bad foods, the problem that quickly arose was that many foods can be ambiguous. For instance, cheese is high in calcium, but is calorie-dense and high in saturated fats. It can be a good or bad food depending on various factors. To prevent the ambiguity, we simplified the list. Good foods will only consist of fruits and vegetables. Bad foods will only consist of sugary foods and drinks. With this ruleset, we still have 20+ food items available. In addition, each food model now has an outline that clearly shows if the food is good (bright green) or bad (bright red). When the player picks up the item it will emit particles that also signify the food’s status. The food models themselves have also been simplified a bit. All foods are now a similar size. We received complaints that food was traveling too fast and was troublesome to manage on higher difficulties, so we reduced the speed at which their thrown. Now it is easy to smack foods out of the way using a tray, power-up, or another food item. With this potentially final major update to Food Fight, we sought to simplify gameplay while expanding it at the same time. 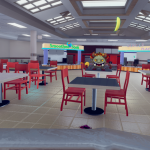 The entire game will now take place in a food court setting that is radically different and much better than the previous cartoon kitchen assets that were used. From their wrist menu, players will be able to change all aspects of gameplay with no need to change levels. The food list has been condensed after the removal of ambiguous food choices and given new shaders and effects that clearly highlight whether they are good or bad foods to eat. New behaviors have been added to food to change their gravity setting and variation in the angle they are thrown at the player. If this is the last update to Food Fight, it will be an exciting one for returning players and new players alike. 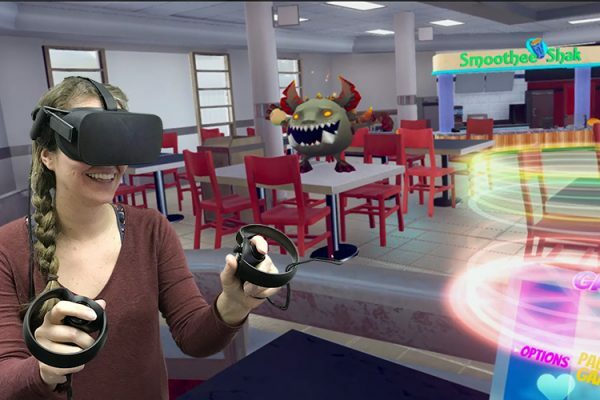 You can read more about Food Fight on the game website, or download the game for free on the Oculus store. Rim is a Unity and C# developer and is most interested in how games can work as a medium for compelling storytelling and entertainment. 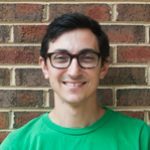 In addition to his work at Health Impact Studio, Rim owns and manages a local business in Durham, plays on a local club Ultimate Frisbee team, and spends as much time as he can traveling and exploring the outdoors! Food Fight V 1.0 Released! Want to be kept up to date on the latest news? We’ll keep you up to date on the latest news! Check out our other amazing games available on the play store! We appreciate the feedback, it helps us improve our product for gamers to come!